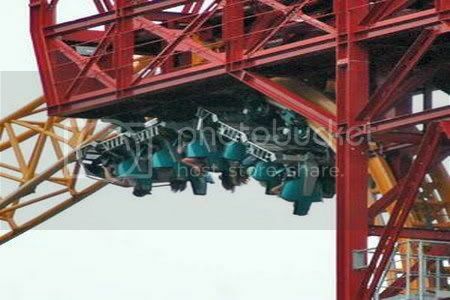 On 13 June, a dozen riders on an Arkansas roller-coaster were left hanging upside down - 46 metres above the ground! - after a power outage shut down the ride. It took about 30 minutes for firefighters to rescue the riders using a ladder truck. Well, it's better than flying JetStar. Hairpiece glue, don't fail me now. Why didn't I notice the name of the ride is 'Power Outage'? Who's operating this thing, Lindsay Lohan? Worst Al Qaeda plot ever. This isn't as disappointing as the 'Sopranos' finale.